Most of you avid retail lovers will never have the opportunity to touch authentic silk chiffon. Vintage lovers rave about the airy ethereal qualities of silk chiffon. This 1950s vintage silk chiffon dress makes me feel like I’m floating above the clouds while being serenaded by baby pugs. Yes, this dress feels like heaven. I fell deeply in love with this dress the moment I saw it. It looks like it came straight out of Betty Draper’s closet. Spanx are not required when the waist on this dress already cinches me in like a corset. This dress magically turns my chest into a B cup! It’s a miracle! If by miracle you mean squished and flattened like when I get my annual mammogram then yes…it is a miracle. This dress should have come with a warning before washing though. It came out looking totally different than when it went in. Washing silk chiffon may result in the length shrinking by a foot or more. I’ve learned this the hard way…more than twice. Washing any silk is risky but certain ones such as silk chiffon are very prone to shrinking resulting in a full length acetate slip with what now appears to be a light and airy chiffon tunic on top. One thing I’ve learned in my thrifting is that shrunken fabrics can sometimes be stretched back into shape. I’ve stretched back wool, rayon, cotton and silk. Fill a sink with warm water and 1/4 cup of hair conditioner or Woolite. Soak the piece for 10-20 minutes. Do not rinse. Gently press to remove water. Use two towels, one on top, one on bottom to blot and absorb the water so the piece is just left damp. Slowly stretch the piece back into shape. Take your sweet time stretching back the material. Work at it slowly and be gentle as wet fabric is weak and prone to tearing. Sometimes, like with this dress, you may stretch too hard or too quickly and you risk damaging the piece. There was already a small tear in the chiffon and of course when I went to stretch the fabric back out it tore even more. I cried a bit when that happened. Repairing tears in chiffon is not easy or pretty. With perseverance and patience I was able to stretch the dress back to the original length. Have you ever accidentally shrunk a piece of clothing? Did you try to stretch it back into shape? This used to be my Mommy’s sweater. Or did you just put it on your fur baby and call it a day? For more of my Fantasy dresses see Part 1, Part 2, Part 3. Of course I’ve shrunk many an items!! But I never even thought to try to make it bigger again—I just gave it away!! But as a knitter I should know this trick!! It’s not much different than blocking my sweater once they are knitted!! I’ve actually tried to shrink a couple of sweaters that I’ve knitted too big too!! Sometimes with success, and sometimes not so much!! I must say this dress is a dream on you Suzanne!! You look like Belle in Beauty & the Beast!! Absolutely gorgeous!! I’ve also shrunken some sweaters on purpose. It’s hard to get the sizing just right though without going too far and coming out with doll clothes. Do you cry when that happens? As a reseller I think it is inevitable. Wow, what good advice. I didn’t know this was possible. Love the dog-joke, too. This tip would also work to stretch out certain areas in clothing, like the arms which I know you sometimes have an issue with. This dress is gorgeous!! I can’t remember anything ever shrinking in the wash, but since we hang-dry all of our clothes I’ve had to carefully teach Angel how to properly hang up clothes so that they don’t get stretched and misshapen while drying–arrrgh! There is a trick to everything it seems. I did not know this. Thanks for the tip Suzanne! Let me know if it works for you Porcelina! What a shame about the dress! Silk chiffon is luscious and I love, love, love that dress. In my early days of collecting vintage I must admit I did a little too much experimenting when attempting to clean clothing and ruined some beautiful things. One of the things I learned is I’m no longer going to mess with trying to wash silk or rayon chiffon again. Those are two fabrics I am petrified of now! They just shrink too much and tear too easily when wet. And I end up in a funk for days if I ruin a nice piece of vintage. So it’s the drycleaners from now on with anything in those two fabrics. I have had luck with stretching 1940s rayon crepe dresses back into shape though. If you’ve ever tried washing that fabric, you know it shrinks quite a bit. But it is possible to reshape. Very carefully, of course, as that can tear as well, just not as easily as the chiffons. My favorite product for hand washing delicate fabrics is Eucalan. Have you ever tried it? Its no rinse, which is great for delicates as you don’t have to agitate them by having to rinse out lots of soap. Highly recommend. I see I can buy that Eucalan online. I might need to try it. I saw where you’d recommended it on your blog before. Rayon is really a crap shoot when you wash it. Half the time it comes out perfectly and the other half it shrinks into nothing and has crater-like wrinkles that are almost impossible to remove. Whoeaaah! Oh that cute little darling! Very funny. I did try very often to shrink clothing on purpose. It hardly ever works.and I once shrink a sweater of Gerben, but then I didn’t know about your tip yet! If you were trying to shrink cotton or wool it shrinks easily. Polyester won’t shrink at all. Usually man made materials don’t shrink but often natural ones will. That dress looks so pretty on you, the colours are like the sartorial equivalent of a Battenburg cake. Funnily enough a friend came round today with a vintage silk chiffon dress she’d picked up for me in a charity shop but, being an ace pal, she’d laundered it already, what a star! Great to have friends like that! Yes…stretching something back into shape is always a bit of a gamble. Oh yeah, I’ve washed but never stretched back – that garment then heads back to The Great Thrift Shop Beyond. Sometimes the pieces are too precious for that. Finding 1950’s vintage is so difficult now that I tend to hoard it like I’m saving the last drops of water before the world sinks into chaos. I may be a bit of a vintage drama queen. Stunning dress on you, Suzanne. I wish I had known about this trick years ago when I ruined a favourite vintage dress. Some entrepreneurs on Dragon’s Den once promoted their de-shrinking concoction, I’m sure based on the cream rinse technique. I’m glad you got this beauty back in shape. Little rips and repair jobs, we live with them. Zoe is sooo cute is your sweater. Heh. Did those people get their investment from any of the Dragons? I had to look it up. Their product is Unshrinkit, and it looks like it was on Shark Tank. One guy invested in it and this is considered a success story. The product formula is patent pending. Absolutely stunning dress Suzanne! Everything about it, the ethereal fabric, the soft colors, the fit…great tips for the shrinking issue, but for me, I will say that is one of the reasons I get so many of my clothes so inexpensively….I am a tiny thing and when I go to second had stores, the things I get are priced low because they are so small. Loved the sweater on your canine model! Zoe hereby gets a raise, or a new little sweater ! I often think of you when I’m thrifting because you and Sherry (Petite Over 40) are the only two people I know that would fit into lots of the pieces I find. I have no idea. I never wash silk but bring it to the dry cleaners. They earn a fortune just from me. What I do know is that this dress is super, super gorgeous on you. A big wow. 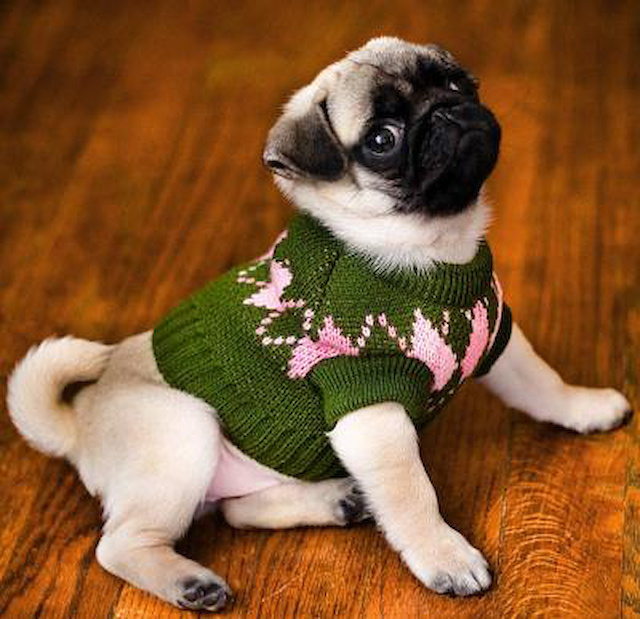 PS what a cute pug in that sweater. I had no idea you could stretch chiffon back. 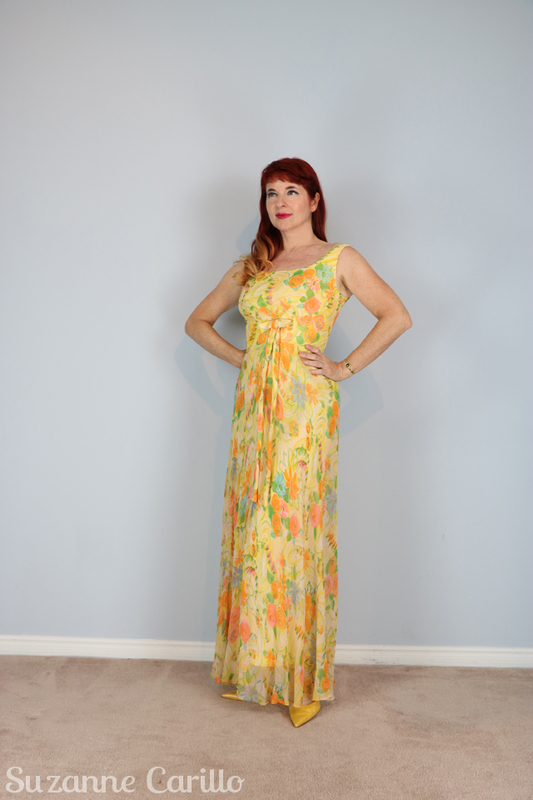 I washed a vintage chiffon gown in woolite by hand and it shrank. I never even got to wear it. I was absolutely heartbroken and cried a little bit. The dress looks beautiful on you. Glad you were able to salvage it. Thanks for the tip. So sweet, your pug, in the mommy dress 🙂 And the maxi dress in yellow is amazing! The miracle is impressive, too 🙂 And above all, I have “lost” some sweaters because of shrinking, and I thank you so much for the tip! I will certainly use it if a piece of wool or chiffon shrinks! It sounds effective, I am sure it is! Bisous! This dress really is special and has that pretty 1950’s feminine vibe. I love your haircolor with the colors in this frock as well. I’ve also been axmiring the little side sweep in your bangs Suzanne! Very attractive!! The expression on Zoe’s little face is so cute! She’s a little sweater girl! That little sweep in the bangs is necessary when I try to curl my hair. I almost always had side swept bangs before I went with this blunt cut. I didn’t love yellow before this year either and then I fell head over heals for it. Red too. Yes, I’d read also that baby shampoo works too. I use Eucalan too for washing bras and other delicate clothing items and I would highly recommend it. I don’t think I’ve ever shrunken anything, at least not anything that I really liked. That yellow dream of a dress is so lovely on you. I’m glad you were able to get it back to its original length. thanks for the tip!, I think that anybody has washed some nonwashable clothes, and results have been ‘assorted’. I’ve never had a problem when washing my wool coats . My tip: I don’t hang them inmediately, just let them on a plain surface (outside) until they lose almost all the water. Once I shrunked a skirt lining (only the lining, isn’t it ridiculous?) and had to remove it. It was a beautiful skirt and I was very dissapointed. Your chiffon dress looks really like heaven, with pugs and all kind of cuteness!! And you’re particularly gorgeous wearing it! indeed! How am I supposed to focus when the last thing I see is Zoe in a tiny sweater that “used to be Mommy’s”? Ha ha ha ha ha! I am dying laughing at the look on her face and the caption. Okay. Okay. I’m calm now. I didn’t realize you could stretch out something that has shrunk! I am going to give this a try on a throw pillow cover that I shrunk and cried about after. I thought it was a goner for sure (and it may still be because it involves two layers of fabrics) but I’d love to get it back if I could. So I’m going to give your tips a try. And if it doesn’t work I’ll give it to you to give to Zoe as a pug pillow cover to go with her sweater. Oh thank you for this! I had washed a beautiful vintage gown today that I don’t Think had ever been cleaned. I shrunk the chiffon top layer. So- you suggest that I soak it and try again with stretching ? I’m so nervous to make it worse. While trying to stretch it after I noticed it had shrunk- I tore the bottom. I cried- a lot!! Ugh- can I save it? Do I soak it and try again you think? This did make me feel better knowing I’m not the to dumb one to try and hand wash.
I’m sorry to hear your vintage gown shrunk and ripped : ( That hurts. That is one of the issues with trying to stretch out chiffon as I’d mentioned, it is prone to tearing. I don’t know if I would try to soak it again, you might just rip it more. Is it possible to hem the lining so the dress is just worn as a midi? Otherwise I don’t have any suggestions. Vintage is delicate and temperamental.